After setting up my reef around 3 years ago, and barely getting past the "trouble stage", I ended up having to empty it out and let it stand by while I was working away from home. Unable to take care of the tank I decided it was best to let it stand until I could, and now's that time! 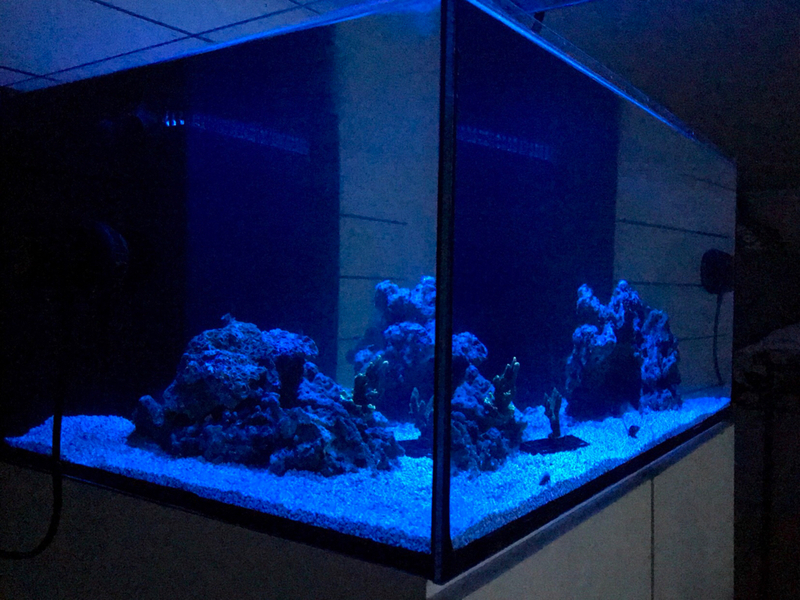 Tank: 75x50x35, rimless optiwhite, drilled and running a simple but quiet overflow. Sump: 65x42.5x35, built in top-off section. Light: ATI LED Powermodule hybrid, 24" 4xT5, 1x 75w LED. Skimmer: Bubble Magus Curve 5. Zeoreactor: Cleartides 1L, will see if I keep this or if I try and find something automatic in the future. Doser/ATO: Pacific sun kore 5th. Tank is currently cycling, on day 9 so soon time for a few grazers and a test SPS to see how everything is going. During the first few days the tank went through the expected diatom bloom, and I'm currently experiencing some kind of green algae slowly spreading throughout the rockwork. Hoping that once the herbivores get in, the algae will disappear, especially with nutrients being so low. 20. What test kit do you use (how old, recently switched, etc.) Refractometer calibrated before/after every testing. Hanna for Alk and ULR phosphorus. Salifert for the rest, 2 weeks old. 21. Present dosing, amounts and intervals (ZEOvit, ZEObak, ZEOfood, ZEOstart, ZEOspur2, etc.) 375ml zeovit stones, 145l/h flow measured. 2 drops of ZB, 2 drops of SP, 0.15mlx2 ZS3. Glad to have you guys aboard! Welcome back, looking forward to see the progress of your new system. Thank you Alexander, glad to have you following along! Apparently the zeovit is doing its job of stripping the water of nutrients. Will be interesting to see what happens once the first fish gets in and some food starts being consumed. Today I have prepped the KZ active carbon (150ml), by first "activating" it with near boiling RO water, and then rinsed it with more RO. Currently "soaking" in RO water overnight, ready to be used tomorrow when first animals get in the tank. Will be using a filter mesh bag, and placing it where the water goes in to the return area of my sump. Tomorrow I'm able to go to the LFS, and hopefully find a suitable fish, ideally a blenny to help with the algae. Will also pick out good test coral, perhaps a montipora or seriatopora. Ofc also a CUC will be added, hopefully they have some Turbo Fluctuosa in case my algae issues turn out to be Bryopsis. Since nutrients are so low, it would surprise me if the bryopsis actually turns out to be an issue at this stage. Lastly I'll receive my replacement control box for the ATI, which will (hopefully) fix an issue I have with the T5's "flickering" when they're supposed to be turned off. Really good service from ATI and the retailer on sorting that out. Pics will come tomorrow once I get everything in the tank. 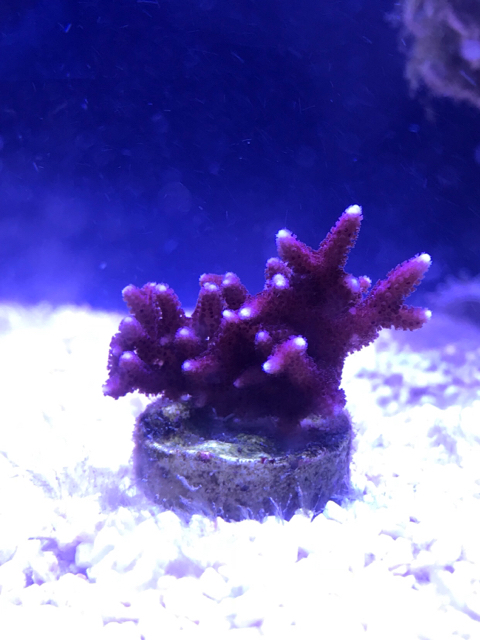 Was able to visit the LFS today and get some living things in the tank unfortunately they’ve just moved and didn’t have any suitable fish in... but got a CUC and 2 frags to “test the waters” a bit... a Montipora confusa and an australian seriatopora hystrix. Both looking great now about 9 hours since getting in the water, the montipora had some mucus out for a bit, but that disappeared quickly. Both were dipped in FM “The dip” but nothing else than isopods came off the frags. Also got an assortment of invertebrates, the hermits are doing a good job of clearing some of the rocks from algae already, hopefully they’ll keep it up! Noticed I desperately need to start using the proper camera with a yellow filter for night pics, impossible to catch fluorescence with only the iPhone. Definitely diagnosed the algae as Bryopsis, have manually removed some today, also trying to get hold of an bryopsis-eating nudibranch (Elysia Crispata) as it's spreading a bit too quick for my liking. 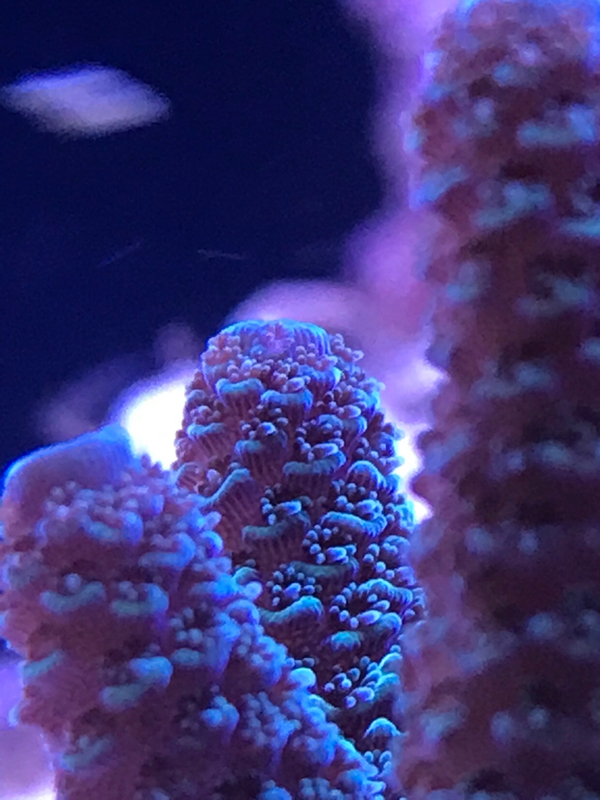 The corals are doing good, lots of PE, no loss in color. They've yet to be moved from the sandbed, and light is still set in "acclimation mode". Will move them to the rocks tomorrow and keep an eye on how they react. Will ramp up the light to normal during beginning of next week. So, 14d cycle has passed, since there’s no fish in the system yet, should I still “decrease” dosing of ZB and SP as according to the guide? Will try to get the first fish in the system the following week. 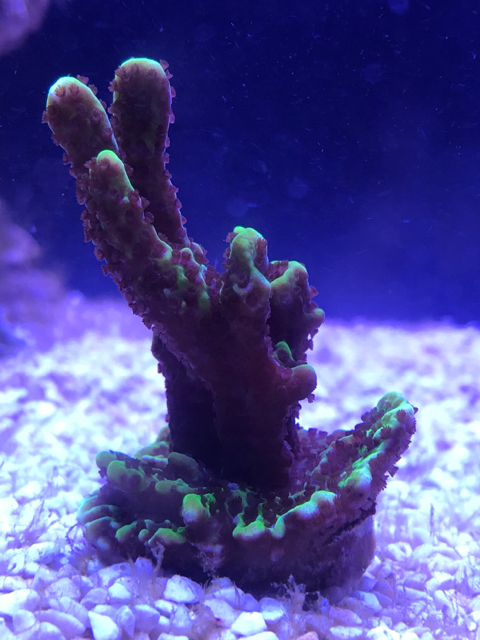 Corals look to be doing good, the monti is getting harassed by hermits on a daily basis, so need to get that off the sand bed, the hystrix has been mounted to the LR. “Still battling” the algae/bryopsis, although it looks to have trouble growing back in the places where it’s been removed, either by me or the blue tux urchin. Hopefully that is due to the low nutrients. Will perform a full test of parameters later today. KH: 7.4 - Dropping quicker than I thought it should. Have some buffert standing by to keep it at just over 7.0. Will decrease ZB to 2drops 2-3x per week, will continue with SP and ZS3 as before. 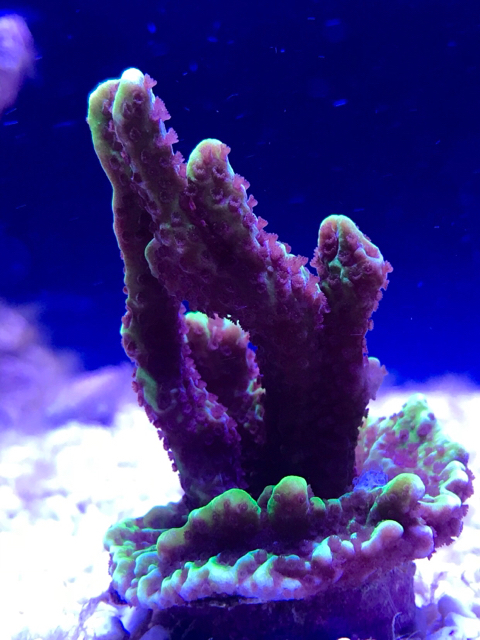 First acro frag is in the system! 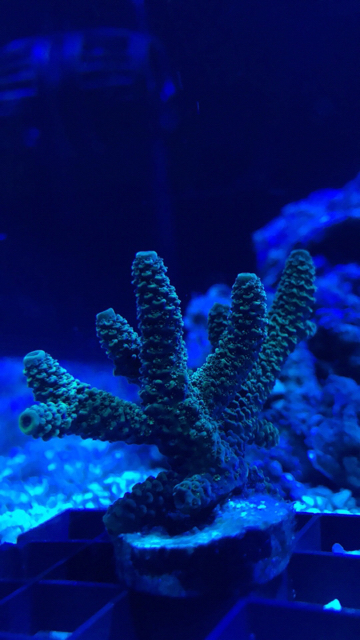 no clue which variety it is, will post pictures when polyps are more extended. Supporting my theory of low-food/nutrients in the system, is that algae (some benign type of bryopsis) is not really growing, at the point where it's barely surviving I think. After removing some water for acclimation of inverts /dipping of acro, Sg is down to 1.0253, will test KH, PO4/NO3 later tonight! Camera captures the coloration really badly, it’s metallic blue-green, with a little more green in the tips. I think it’ll be very nice once it settles. Kh 7.5 - staying where I want, dosing 15ml, equivalent of 0.2 spread out over the day. Dosing stays the same: 0.15mlx2 ZS3, 2dr SP daily, 2dr ZB x3 week. This morning PE was noticeably better, snapped a few shots in an effort to ID it. Algae is losing the battle atm, sand is mostly clear, and the urchin is making pretty good progress on the rocks. Guesstimate about 10-20% of the algae left, hopefully they’ll be completely gone soon. Came home today to the Hystrix with very reduced PE, which is weird cause the monti and Acro were both happily displaying theirs. Performed the first WC (8%-ish) and Zeovit change (50%) this Sunday. ZB: 2 drops for 10 days after ZV change, then back to 2 drops 2x/week. Finally got some fish in! Decided on a small pair of Occelaris clownfish, only about 1" and 5/8" "large", but seems to do great (been in tank for 2 days). Also got a nice gold Euphyllia which I hope they'll decide to call their home sooner or later. ATO is still broken, and so far no luck on getting hold of a new optical sensor. Dosing top-off manually 2/3 times daily atm. Seems like the silicone/epoxy/plastic on the sensor had "dried" from my storing of the unit for 2 years, and some cracks in that let water in made the sensor send faulty signals to the kore 5th. 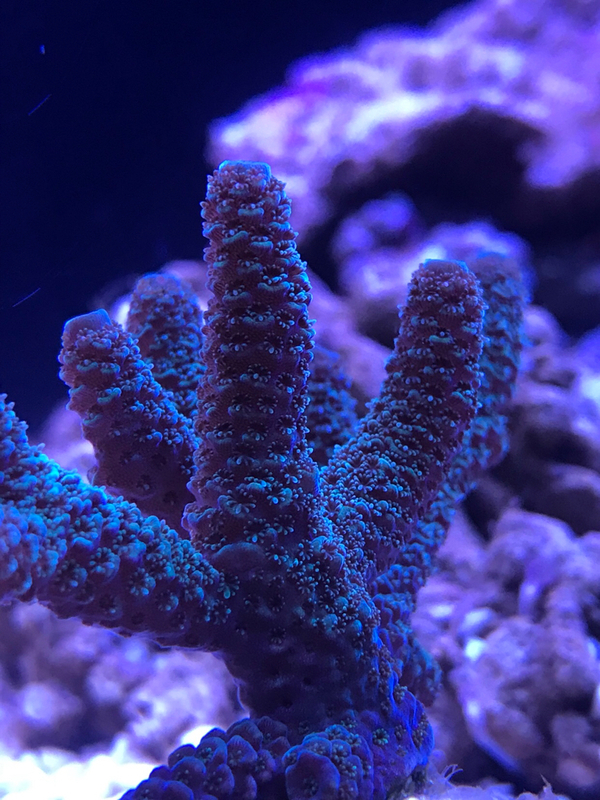 Otherwise everything is tugging along, seeing some growth on the SPS, which is nice especially since the salinity isn't super stable for the moment. Hopefully I'll receive a small shipment of sticks within a week, so slowly stocking the tank. Started dosing CV, will see if it has any effect on corals. Plan is to dose 2 drops every second day.